It may still be the middle of winter but I’ve got some serious spring fever, especially when it comes to shopping for some wardrobe updates. While I did make a smart choice for this time of year and went with a lovely oversized camel pea coat, I did decide to throw in a bright colorful Blue and White floral dress with lovely peplum side details as well, for you know- Spring! When looking for some new fashion updates for the new -Hopefully warmer- season that will be approaching, I started looking for some great places to shop to help keep my budget from going kilter. I love Spring because it’s easy to update your wardrobe with super fashionable, on-trend items at reasonable prices. Shopping for warmer winter clothes can usually be a bit more daunting, and call for a little more penny when purchasing wardrobe updates. That however, still doesn’t mean you can’t find a fabulous warm, cozy, comfortable coat at a great price though! You can find anything you could possibly need on any of these sites, but since we are talking about fashion, let’s cover what you can find at Acevog and Meaneor. Both sites offer a great selection of outerwear, tops, bottoms, dresses, knits, skirts, blazers, swimwear and more! I happened to find a beautiful Camel Peacoat from Meaneor, and a pretty blue and white floral peplum style dress from Acevog. What I was thrilled to see when these products arrived is that they are of course true to size, and the quality was actually quite a bit higher than I thought it would be for the prices you pay! In fact, the coat was $39, but rivals some of the more expensive coats I have in my wardrobe. The coat is thick, well made, sewn together nicely, cozy, soft, and WARM! 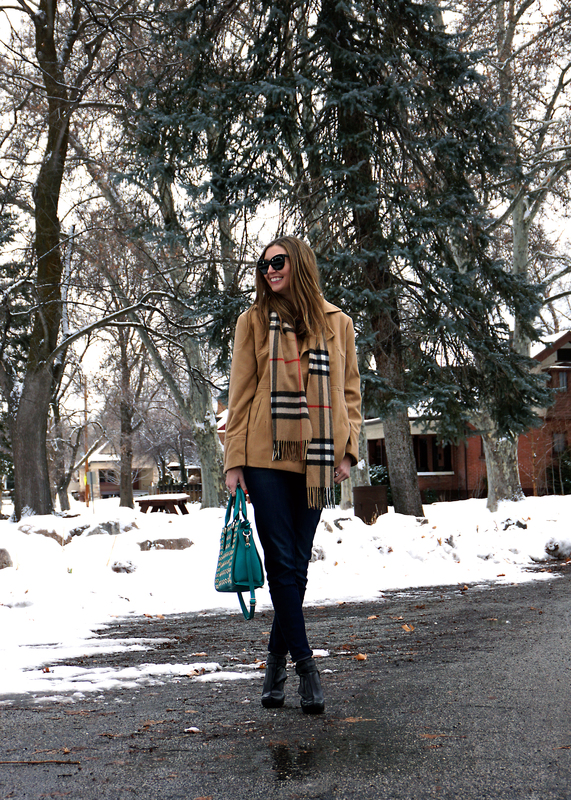 It is a great coat for this time of year and for those colder days in the spring too! Available in camel, black, or dark grey, this coat is easy to keep clean too, it can actually be washed in the washing machine! Nice! The fabric is incredibly soft and cozy too. For this freezing cold winter day, it kept me incredibly warm while being outside for a bit, doing my photo shoot for this post. The ACEVOG Rockability Bodycon Blue and White Floral Dress is just $19.99! It is a bit more lightweight (an unlined) making it more appropriate for spring but if you double it up with tights and a nice warm coat, it works great for winter too. My favorite part about it is the cute little peplum-like side flaps. It offers a fun dimension and style to this dress, making it standout from the rest, as if the cute blue and white floral print wasn’t fabulous enough! (The Dress is also available in other floral prints with different colors as well). The dress also comes with a gorgeous gold belt too to really cinch in the waist and show off curves! I love that for my straight up and down, boy shaped body, this dress does a great job of adding curves by playing up my hips with the side panels, cinching me in at the waist to show off the smallest part of me, and has a pretty sweetheart sleeveless cut, which is the best cut for those like me who don’t have a whole lot going on, up top! This beautiful cut makes my small chest look a whole lot sexier. I love that it plays up my arms and shoulders too, and overall makes my appearance look so much more feminine as well. Aren’t these styles great?! I absolutely love how they look and how I feel in them! The coat is so cozy, soft and warm, and the dress is so playful, chic, and feminine, and really plays up my shape too! If you would like to pick up these pieces for yourself or shop the other fabulous fashion from Acevog or Meaneor, you can shop the Coat and Dress HERE, and the sites at Acevog.com and Meaneor.com. Also, right now, one of you is going to WIN FREE PRODUCTS from the sponsor! 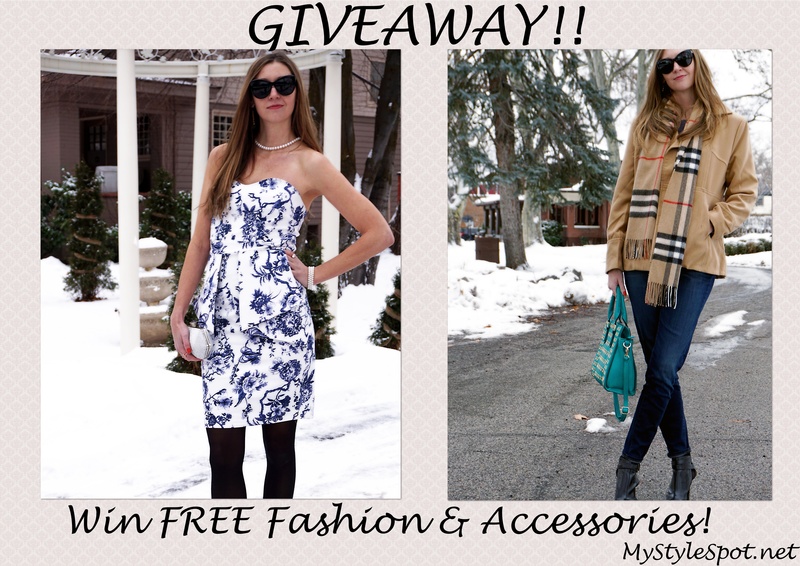 ENTER TO WIN some FREE fashion and accessories in the rafflecopter form below! *Be Sure to Sign up with Your Email in order to Be Entered to WIN! Also, anyone who enters (and registers on the sponsors website) will get a Coupon Code for a Discount to spend at the sponsor’s Amazon Shop! *I was given these products for the purpose of review. However, all thoughts and opinions expressed in this post are solely my own. I only share reviews with my readers, I feel will be beneficial or informative in some way. I like the ACEVOG Women’s Floral Printed Long Sleeve Hooded Pullover and the Meaneor Women’s Courtney Burnout Hooded Pullover. The ACEVOG Women’s Winter Warm Thicken Fleece Jacket Hooded Parka Coat Top would be cool! I love the Meaneor Women’d Down Hooded Jacket Sweater in Navy color! !